Home > Featured > Gyan > Perks_of_PM > Thoughts > Top-Notch > VIP Security > VVIP Travel > Air India One - That's How Indian VVIPs Fly !! Air India One - That's How Indian VVIPs Fly !! While taking a short break in between number crunching on spreadsheets and beautification of decks, I came across a documentary on “Air Force One” the official flight for President of the United States of America. It is showcased as the symbol of Presidency for USA and seat of American power. Watching that documentary, I grew curious regarding the presence of such a ride for the Indian Prime Minister and President. Things are different for a governance arrangement in India with multiple seats of power and numerous VVIPs abound in our system. For us, both the President and the Prime Minister both coexist and even though unbalanced executive powers are divided between the two, comfort of travel need to be provided on a similar level and should meet the best possible standards. Besides them, there are other dignitaries who would need such luxuries and would not compromise on the quality of travel. Thus, I started thinking about what provisions do we have at home in India for the air travel for those the at helm of power and so started my quest for the research and following is what I discovered. Although there isn't a lot of documentation available on the subject primarily because these have not become a glamorous symbolization as “Air Force One”, I did come across a glimpse of VVIP travel through various news reports and experiences of journalists onboard some such flights. The first question that comes to mind is if there is a special plane similar to the two planes popularly known as Air Force One in India which carries our PM and the President. Well, there is no specific answer to it as Yes or No. For short haul flights, we have three Boeing Business Jets (BBJs) which have been specifically procured, designed, equipped and maintained for travel of the Prime Minister and the President. One BBJ is reserved for the two dignitaries at the top of hierarchy of Indian Government, second for other dignitaries while the third is kept on standby to act as backup if required. 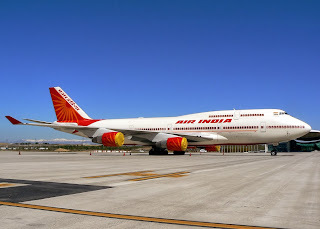 However, these jets have limited range and hence for long haul intercontinental flights, there is a provision to pull in a special aircraft from the fleet of Air India and configure for VIP travel. Let’s look at both these rides in some more detail and understand the provisions and set up of these air crafts. 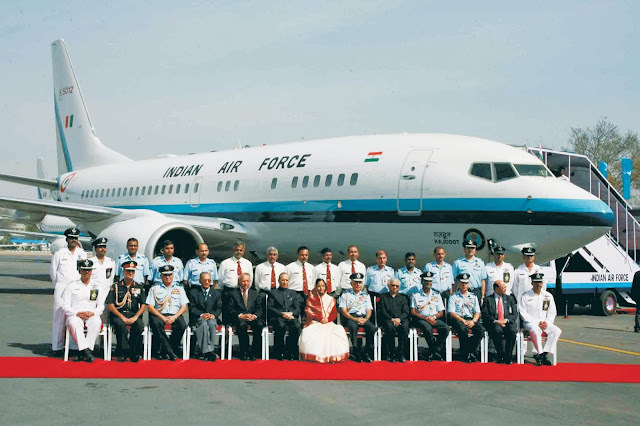 Three Boeing Business Jets were procured by the government in 2008 for enhancing the comfort on the VIP flights and replace the aging fleet of 737s used earlier. These aircraft built on the platform of 737-700 aircraft models of Boeing in terms of airframe and features of 737-800 are most advanced machines from Boeing’s stable. Powered by two C FM-56 engines, these birds can cruise at 41,000 feet at speed of 450 knots. Each of these three, christened Rajdoot, Rajhans and Rajkamal, have a specially designed self-protection suites (SPS) including radar warning receivers, missile approach warning systems and countermeasure systems along with the capability to shoot metal chaff and flares to deviate radar-guided missiles and heat-seeking missiles off the track. Other safety features include those that take inputs from other systems and aircraft, generating advisories in order to obviate any situation that comprise the safety of the aircraft such as EGPWS (Enhanced Ground Proximity Warning Systems), TCAS (Traffic Collision and Avoidance Systems), Intruder Detection System and Emergency Equipment provisioned with a resuscitator, automatic external defibrillator, therapeutic oxygen cylinder, life rafts and emergency medical kits. These aircraft are divided into three zones with a capacity to carry 60 passengers and have a spacious private cabin for the VVIPs on board to provide them the best possible comfort in the skies. These jets along with rest of the fleet are maintained by Air Headquarters Communication Squadron of the IAF based at Palam Air Force Station in Delhi. However, the only drawback of these aircraft is the travel range on single fuel load which limits their use for domestic travel or tours of neighboring countries. Thus, there is a separate provision for the travel beyond the range of these BBJs. 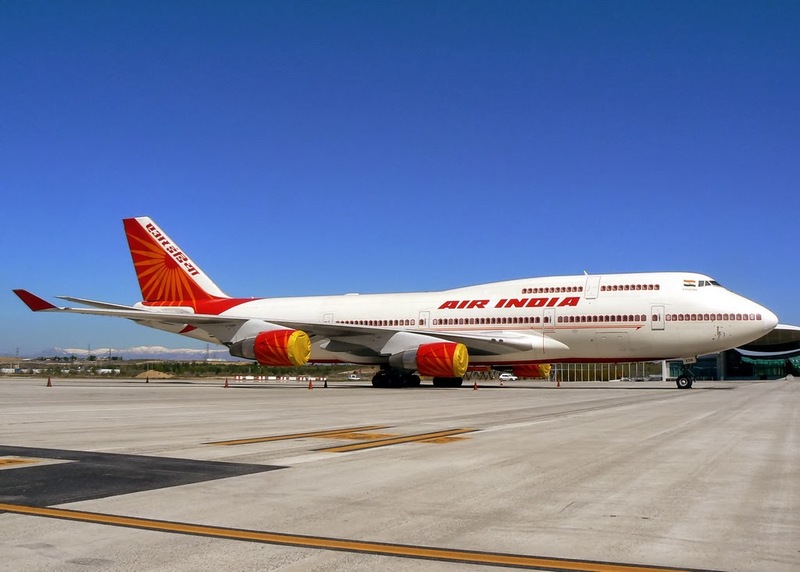 For long haul travel of the President or the Prime Minister, Air India maintains two earmarked Boeing 747-437 Jumbos. Whenever a foreign travel for these VVIPs is planned, these aircraft are requisitioned by the external affair ministry for use during the journey. The Special Protection Group (SPG) takes these planes in their possession a week before the planned departure and sanitizes them thoroughly. While one is prepared for the travel, other is kept as standby. Once, security screening is complete, these are completely reconfigured as per the requirements of the VVIP and specifications of the SPG. At the minimum, these jets are fitted with the VVIP configuration procured separately from Boeing which provides a VIP suite – all set with a bedroom, a lounge, a six-seater office and satellite phones. Unlike in the case of the Boeing Business Jet (BBJ) which comes with its own onboard 'self-protection suite', an external air defense system is in place for these jumbos from Air India. When these 747s carry the President, Vice-President or the Prime Minister, they carry a call sign of Air India One or AI1. It is rumored that there is a panel of eight pilots with Air India who have been cleared to fly AI1. As far as the operations are concerned, any VVIP flight is supposed to have four pilots at any point of time and are monitored in real-time by personnel at the Palam Air Force Station. During any international travel plan, all the countries en-route the destination are advised about the VVIP flight and necessary provisions put in place to handle any unforeseen emergencies. Every aspects of operating such flights are considered in thorough detail and only the best and experienced of the available pilots are allowed to fly on these journeys. Equally thorough is the security considerations are for such flights. As soon as the journey is planned, trained commandoes from the SPG join the Air Force personnel to guard these planes. Every corner of the aircraft is searched and swab tests conducted to find traces of poisonous substances. Fuel and spare parts for the flight are inspected and sealed to prevent any possible sabotage. While in air, surrounding skies are kept clear of the traffic and fighter jets are kept in standby mode to respond to any threat to the plane. Protocols require all the passengers on such VVIP flights, except of course the VVIP and senior bureaucrats, board the plane at least 3 hours prior to the departure. Immigration and check in facilities are provided from a temporary make-shift facility at the Palam Air Force Station. Every passenger is required to wear the id provided by the SPG at all times. These ids are color coded based on the role/ position of the bearer to allow easy identification of access levels, seating arrangement and protocols. The senior members of the delegation accompanying the VVIP are tagged in purple and enjoy first class seating while junior members are provide business class accommodation and share pink tag with other support staff. The support staff and other aids to the VVIP (butlers, cooks etc. with red ids) are seated in economy class configuration along with the additional security team (non-SPG members). Media personnel are provided yellow tags and enjoy business class facilities. VVIP of course gets his/her own private cabin to work or rest. One of the luxuries of these flights is the kind of onboard service that money can't buy. It's efficient, unhurried and charming. If you refuse dessert, the stewardess, who will address you by name, will urge you to try a little. Onboard facilities including a menu are decided based on the preference of the person in the private cabin, however, everyone gets to choose from a generous list of items and seldom one sees the crew nodding in no for a request. Another luxury extended to the VVIPs is the opportunity to fulfill their whims and fancies which otherwise can only be dreamt of. One such passenger wanted to have a glimpse of the Pamir Mountains on the Afghan side of the Himalayas and captain of the flight had to take special permission from the authorities in Afghanistan who obviously were more than happy to cater to the special request of the guest from India allowing a perfect view of the “roof of the world”. 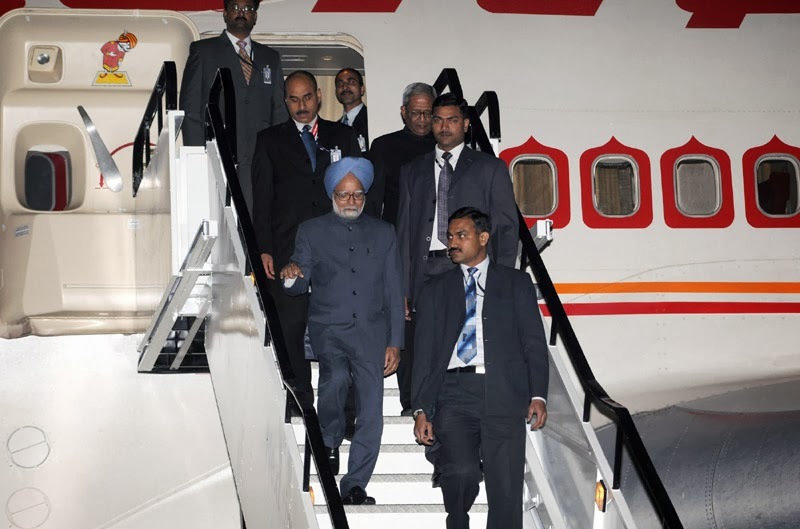 I realize that the facilities available for air travel for Indian leaders are in no way lesser than the ones offered by the well-known picture perfect Air Force One. Indian forces provide the best possible comfort and security to the guests and actually have a much challenging job than their counterparts in US. There only one person is in charge who’s needs are to be catered to while in India we have at least three persons (President, Vice-President and the Prime Minister) who are to be accorded with the same standards of services ensuring each one's tastes are adhered to and requirements fulfilled. Moreover, rather than the aircraft, it is about the guests that these flights carry elicited from the fact that any aircraft carrying the dignitary is given that call sign and it is not attached to the plane as such. Still we do not have a very prominent symbolism attached to these provisions partly probably because we still are a developing nation with people suffering from poverty, illiteracy, unemployment and other similar ills and it does not politically or otherwise makes sense to flaunt these luxuries. They are better kept under wraps to ensure those who enjoy these continue doing so. Thanks Ashish :) Really appreciate your comments !! Really had lot of information. . Of whom I was unaware. Though a superficial luxury, it is intriguing that we have the best in world and still try and keep it under wraps !! how many times have you refused dessert on the plane? On a serious note, I tend not to refuse in the first go as I am pretty sure they are not gonna ask again!! Hi. Just curious - for the AI-1, how is the separate VVIP configuration maintained? In what form is it stored when not in use and how is it installed on a B747 that is otherwise used for commercial fights? Hi Paras, interesting question and frankly I had not given that angle a thought. However a quick search reveals existence of similar kits which are gaining popularity gradually. Maybe following links help satiate your curiosity, even if partially. Very informative article. It's a nice read. Thanks for the good words SoloBackpacker. Hope you keep visiting the blog.